General naval discussions that don't fit within any specific time period or cover several issues. I'm writing a novel set aboard a Clemson Class destroyer. The simple premise is that a lone destroyer encounters the Japanese fleet en route Hawaii on December 5, is damaged in the initial encounter and can't communicate with the beach. The ship makes a desperate two-day run for Pearl Harbor in order to warn the fleet. The story centers on a young ensign forced to take command when most of the officers are killed in a follow-on attack. Would anyone be willing to read chapters as they roll off the press and critique for technical accuracy? I served aboard modern aircraft carriers and amphibious ships for 20+ years. I am amazed at little I know about the pre-WWII U.S. Navy. Help! I don't think any of us are better positioned than you are to write about life on a USN destroyer. I would suggest googling "USN destroyers in WWII" as I just did to get a nice reading list. I am retired USN but served in submarines and we both have a lot of useful knowledge, but things were a bit different back then and in no way would I consider myself better qualified than you are. Generally, the major faults with the 4 stackers were relatively short range although this was negated by the post WW1 introduction of underway oiling; very wet boats forward due to the lack of sheer and flare to the bows; fairly wide turning radius due to the narrow cruiser stern (improved somewhat with a larger rudder in the Clemson class but not completely solved until the commissioning of the first of the Farragut Class in 1934). The 4 stackers also had a reputation for excessive roll, even in fairly calm conditions. In heavy weather this must have contributed crew fatigue and a corresponding lowering of moral and combat readiness. On the other hand, for their day, they were heavily armed with 12 torpedo tubes and 4 four inch guns. And saved the sum of things for pay. You might ask over at ww2f.com, they're a good bunch and usually helpful. Tell 'em I sent you. This proposed novel poses some interesting questions. As at 5 December 1941 Japan is not at war with the US. Legally neither side can open fire, both the Clemson and the IJN are sailing in international waters. If the Clemson fires first what is the source authority for this? The vessels CO on his own initiative, or the US Pacific Feet command in Hawaii? Potentially that situation could change the course of history as President Roosevelt would have to reckon with history recording that the US made the first shot - reference to his speech in Congress declaring war on Japan. I assume the proposed novel would detail that the Japanese fired first in an attempt to prevent a sighting report and that the ships radio is destroyed and that the ship outruns initially the Japanese ships. But why run to Pearl Harbor? Not Midway Island? Not seek out a fishing boat with a radio? And in what circumstances would the USS Clemson be alone in the first place and not part of a several ship scouting force? If the destroyer were deploying to Pacific Fleet at Pearl from say a refit at Bremerton Naval Yard in Puget Sound, WA, her captain would probably have followed the currents of the North Pacific gyre a part of the way to conserve fuel and come in towards Hawaii from north-northeast. This could have put the destroyer very close to the path of Nagumo's strike force by Dec 5. RF wrote: This proposed novel poses some interesting questions. When Halsey asked Kimmel what he should do if he met Japanese forces on his way to Wake Island Kimmel said "Do what makes sense." "Best goddamn orders I've ever heard. If I see so much as a sampan I'll sink it." His orders to the force were "We are now steaming under wartime conditions." SIX Japanese carriers approaching Hawaii under stealth conditions (based on the route they took and the radio silence.) And remember that they were under orders to press home the attack if discovered in the last 24 hours before the attack was to launch. Suggestion: A storm (and there was one) drove the other picket destroyers back to Pearl. We can document this in that Halsey's force had to slow because the seas were too rough to refuel the DDs, causing them to slow down. This storm saved Enterprise as she was due in Saturday afternoon. It requires some diligence to find these things...and they may not all be available online. 3) The very last thing I would recommend is for you to attempt to write/structure/critique anything by internet committee. That is a certain recipe for failure. 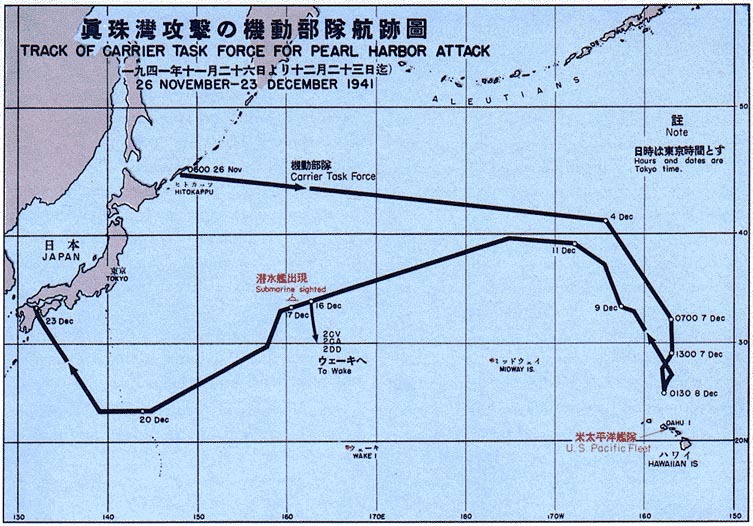 Note that the dates & times shown on the map are Tokyo time, so 0130 December 8th is (iirc) 0700 December 7th at Pearl Harbor. Probably better to head straight to Pearl. Just because it's stupid, futile and doomed to failure, that doesn't mean some officer won't try it.